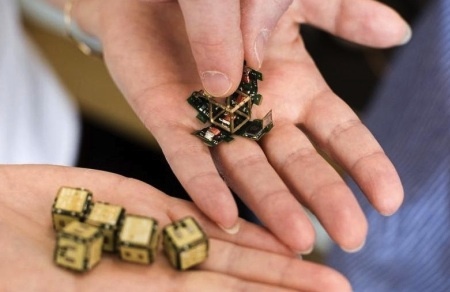 Smart sand or robot pebbles - these are the names given by MIT researchers to small prototype robots that self-assemble into three-dimensional shapes. This is an alternative to other forms of 3D printing. Science fiction fans have been given ideas like this to think about for a long time. In his 1954 novel The Invincible, Stanislaw Lem writes about a shape-forming swarm of tiny metal particles. Thanks to Blue Monkey for contributing the tip on this item. End update.